Additional NARPA 2019 information here. NARPA’S mission is to support people with psychiatric diagnoses to exercise their legal and human rights, with the goals of abolishing forced treatment and ensuring autonomy, dignity and choice. Amicus brief, submitted on behalf of NARPA, WMRLC and persons who have experienced civil commitment, in a case challenging the hospital's refusal to hold civil commitment hearings in a courthouse rather than at the psychiatric hospital. NARPA's newsletters (originally published between 1984 and 2002) are now available to read on the web, courtesy of the University of Massachusetts Amherst Special Collections & University Archives Librarians. The Needs of People with Psychiatric Disabilities During and after Hurricanes Katrina and Rita: Position Paper and Recommendations A Report of the National Council on Disability, prepared and drafted by Susan Stefan and Ann Marshall of NARPA. National Institute of Mental Health (NIMH) director, Thomas Insel, M.D., announced that psychiatry's standard treatment for people diagnosed with schizophrenia and other psychoses needs to change. Read here and here. Esteban Santiago flew from Anchorage, Alaska to Fort Lauderdale to commit his mass murder. Read Jim Gottstein's op-ed in the Alaska Dispatch News, Alaska's largest newspaper, titled, Misguided mental health system needs an overhaul. Are Psychiatric Medications Making Us Sicker? - Several generations of psychotropic drugs have proven to be of little or no benefit, and may be doing considerable harm. From PsychRights and Jim Gottstein, here is video from the 2014 Protest of the American Psychiatric Association's annual convention in NYC. Connecticut Supreme Court Holds Lawyers, Conservators Accountable In Probate Cases: "The ruling has far-reaching implications for our troubled probate court system. It means that a court-appointed lawyer...cannot ignore the wishes of a client." Robert Whitaker on the New York Times' In Defense of Antidepressants: "More misinformation in the Age of Prozac" ... the American public has been treated to yet another dose of misinformation." Healing Voices, a new film chronicling the lives of individuals experiencing mental health issues and extreme states, is now in production. The film examines mainstream mental healthcare and psychiatry in the United States through the lens of individuals at various stages of their mental health story; it explores the stigma of psychiatric diagnoses, the role of trauma, pharmacology, alternatives to the "one-size-fits-all" medical model, and the power of storytelling in recovery. NARPA congratulates Disability Rights International Founder and Executive Director, Eric Rosenthal, recipient of the 2012 Public Service Award from the University of Chicago. Eric is a long-time rights activist and NARPA supporter. Read more. Making a Killing: Clinical trials have become marketing exercises for Big Pharma -- and cash-strapped universities are helping make the sale Mother Jonesmagazine sheds light on how drug manufacturers manipulate clinical trials to make their drugs look good - sometimes at the expense of patients' lives. Disability Rights New Jersey has filed a federal lawsuit regarding the involuntary administration of medication to psychiatric patients in New Jersey's public and private hospitals. The lawsuit alleges that the current procedures, which do not provide for an independent review in the event of a challenge to the need for involuntary medication, violate individual rights and fail to conform to present standards of good clinical practice. Click here for the complaint; Click here for the opinion denying protective order; Click here for the opinion regarding motion to dismiss. UN Calls Shock Treatment at Massachusetts School "Torture" See ABC News'report and read Disability Rights International's full report on the Judge Rotenberg Center. Update(May 2011): Founder and director of Massachusetts “Shock School” resigns after being indicted on criminal charges. MDRI's Report concludes with an "urgent appeal" to the United Nations Special Rapporteur on Torture, demanding the US end the torture of people with disabilities immediately. And see the Op-ed in the Washington Post, "Disabled children at Mass. school are tortured, not treated"(10/2/10). Pfizer too big to nail Federal prosecutors say the world's largest pharmaceutical company is too big to fail. When Pfizer was caught illegally marketing a drug that was taken off the market, the feds agreed to charge a shell company which exists solely for the purpose of pleading guilty and taking the heat off Pfizer. A report from CNN's Special Investigations Unit. Poor Children Likelier to Get Antipsychotics New federally financed drug research reveals a stark disparity: children covered by Medicaid are given powerful antipsychotic medicines at a rate four times higher than children whose parents have private insurance. And the Medicaid children are more likely to receive the drugs for less severe conditions than their middle-class counterparts, the data shows. Report of the National Council on Disability: " From Privileges to Rights: People Labeled with Psychiatric Disabilities Speak for Themselves*" -- With a link to the full report. Crazy Like Us: The Americanization of Mental Illness - In recent years, American ideas about psychiatric disorders have spread around the globe. Is that really good for the world's mental health? Read this article by Ethan Watters from the New York Times. Read an essay sharply critical of the psychiatric industry, published in the medical journal, The Lancet. The article reviews two books: The Myth of the Chemical Cure: A Critique of Psychiatric Drug Treatment by Joanna Moncrieff and Side Effects: a Prosecutor, a Whistleblower, and a Bestselling Antidepressant on Trial by Alison Bass. Read the article here. Read the NY Daily News story, **** "Kings County Hospital doctors, nurses facing charges in Esmin Green death-by-neglect case." And read the NYC Department of Investigation's report. 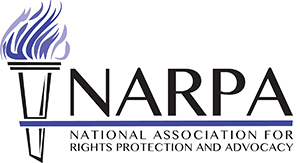 The Rights Tenet Update - From the NARPA archive: The online version of NARPA's Rights Tenet newsletter. With coverage of the battles against forced drugging laws, the "parity" controversy, the Supreme Court vs. the ADA, etc. "Tremors in the System: the help you want or the help you get" a new 23minute film by Nora Jacobson features long time NARPA member and supporter Marj Berthold and her experiences in the Vermont mental health system. Big Pharma Gone Wild: How Risperdal, a drug meant for treating rare psychiatric disorders, became the seventh best-selling medicine in the world. FDA proposal to reclassify electroshock machines - and deem them safe in the absence of scientific evidence. ** Public comments were due by January 8, 2010. Learn about the FDA docket, find out how to view public comments online, and get additional information here. For background, see "The FDA's Regulation of ECT (Shock Treatment): A Beginner (or Refresher) Course." Maine's medication law challenged A new federal lawsuit, filed by the Disability Rights Center of Maine, challenges the constitutionality of a new law that allows patients in psychiatric facilities to be medicated against their will. The lawsuit, which was brought on behalf of an 83 year old woman, alleges that the law violates due process rights guaranteed by the 14th Amendment of the U.S. Constitution; The law fails to provide patients with adequate notice of a hearing or an opportunity to be heard before being deprived of their liberty. The lawsuit also claims that patients may be forced to take drugs that can cause death or have devastating and irreversible side effects, especially in elderly patients. Read more here. The New York State Office of Mental Health is promoting the psychiatric drugging of children: Haldol, Adderall, and Dexedrine for 3 year olds, lithium and Depakote for 2 year olds? See this booklet - a Q & A on using medications with children with mental disorders - published by the State of New York for parents of young children. In Memory and Celebration of Rae Unzicker See "When Women Pursue Justice," a 3,300 square foot mural in New York City celebrating women who led movements for social change in the U.S.A. over the past 150 years, features Rae Unzicker. Keynote Presenters: Michael Perlin, J.D., Earl Miller, Kathy Flaherty, J.D., David Cohen, Ph.D., Tim Clune, J.D. ; Robert Dinerstein, J.D. Keynote Speakers: Robert Whitaker, Caroline Mazel-Carlton, Peter Lehmann, Mort Cohen, J.D., Eve Hill, J.D. Last updated on April 22, 2019.